Carnegie Mellon University (CMU) and Sikorsky, A Lockheed Martin Company, using a UH-60MU Black Hawk helicopter enabled with Sikorsky's Matrix Technology and CMU's Land Tamer autonomous unmanned ground vehicle (UGV), recently participated in a joint autonomy demonstration that proved the capability of new, ground-air cooperative missions. Such missions could prevent warfighters' exposure to hazardous conditions, such as chemically or radiologically contaminated areas. "The teaming of unmanned aerial vehicles (UAVs) and unmanned ground vehicles, as demonstrated here, has enormous potential to bring the future ground commander an adaptable, modular, responsive and smart capability that can evolve as quickly as needed to meet a constantly changing threat," said Paul Rogers, director, U.S. Army Tank Automotive Research, Development and Engineering Center (TARDEC). "The cooperative effort between the Army labs, academia and industry to bring solutions to the warfighter is exciting to see." The Oct. 27 demonstration was for TARDEC, through the Robotics Technology Consortium, which sponsored the Extending the Reach of the Warfighter through Robotics (ERWR) project. A video of the demonstration is available online. The Black Hawk helicopter was provided by the U.S. Army Aviation and Missile Research Development and Engineering Center's Aviation Applied Technology Directorate and was modified with the Sikorsky autonomy kit, Matrix, to deliver the UAV capabilities the program required. "The UH-60MU aircraft is a prototype of the UH-60 in a 'fly-by-wire' configuration," said William D. Lewis, AMRDEC director of aviation development. "'Fly-by-wire' technology is the foundational enabler that facilitates autonomous aircraft operations." Matrix Technology, launched in 2013, was designed to improve the capability, reliability and safety of flight for autonomous and optionally piloted vertical take-off and landing aircraft. In the demonstration, the Black Hawk helicopter was operated in coordination with a UGV, developed by Carnegie Mellon's National Robotics Engineering Center (NREC). The UGV Land Tamer all-terrain vehicle combined key elements of several NREC world-class autonomous systems to support missions in difficult environments. "We were able to demonstrate a new technological capability that combines the strengths of air and ground vehicles," said Jeremy Searock, NREC technical project manager. "The helicopter provides long-range capability and access to remote areas, while the ground vehicle has long endurance and high-precision sensing." 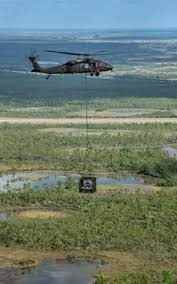 During the demonstration mission, the unmanned Black Hawk helicopter picked up the UGV, flew a 12-mile route, delivered it to a ground location and released it. The drop-zone collaboration between the two autonomous systems demonstrated a uniquely differentiating capability. Over the course of more than six miles, the UGV autonomously navigated the environment, while using its onboard chemical, biological, radiological and nuclear (CBRN) sensors to detect simulated hazards and delivered this information back to a remote ground station. The UGV was optionally teleoperated to explore hazard sites in greater detail, when necessary. "We invested in Matrix Technology because we knew it would mean that, in certain scenarios, the warfighter can be kept out of harm's way and would be able to perform more missions and perform them more effectively," said Mark Miller, vice president of research and engineering at Sikorsky, a leader in helicopter design, manufacture and service. "This demonstration indicated just that." The exercise, at Sikorsky's Development Flight Center, West Palm Beach, Fla., culminated a 19-month project between Carnegie Mellon's NREC and Sikorsky to demonstrate for the Army autonomous delivery of a UGV by an optionally piloted or unmanned Black Hawk helicopter, followed by a long-range autonomous ground mission to collect vital, on- the-ground intelligence. The collaboration between the UAV and the UGV demonstrated the effectiveness of unmanned systems in addressing logistics needs in unknown or dangerous environments.